Pacsafe's RFIDsleeve 25 sleeve material is alumina/poly/paper composition, not prone to tearing and there are 2 sleeves per pack. 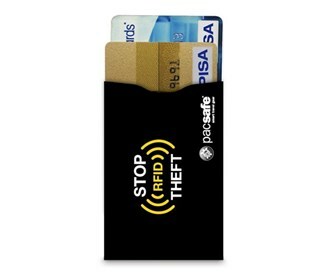 The Pacsafe RFIDSleeve Credit Card has many exciting features for users of all types. See the Pacsafe RFIDSleeve Credit Card gallery images above for more product views. The Pacsafe RFIDSleeve Credit Card is sold as a Brand New Unopened Item.